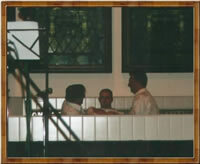 I was baptised on May 6th 2001 at Stirling Baptist Church. Thank you for visiting the page that represents one of the happiest days of my life. To all at Stirling Baptist Church who continually prayed for us. To all my friends who came to the service, and/or who prayed for me on the day.